Another shot of the huge red barn at the Jeter Farm pumpkin patch. You can just see the twins on the tractor. I was going to link with Barn Charm Monday, but it seems it is no more. Sad, isn't it, when blogs dissolve. I still have blogs from several years ago that I miss, and wonder how their families are doing. That's a great picture. I love big barns like that when they're well maintained. Love that picture! The boys sitting on the tractor make it special! I too wonder what happens to the writer and their family, when a blog goes away. You feel this connection to the blogger and then when they are gone you have lost a friend. What a shame that Barn Charm is not there any more. I used to link up with that very often, until I ran out of barns in Dallas. Love your boys having fun "driving" the tractor. I am going to Illinois for Thanksgiving, and love the barns there. Plan to take some barn shots. Guess we will have to look around for another Barn linkup. Have a great Monday! Oh gosh,,, I know. There are a couple of blogs I will always miss too, but guess people move on with life and away from their computer keyboards at some point. So sad and yet probably a good thing to just go live life. Love how you captured that moment in time! They say the average life span of a blog is about 6 months. Some of my favorite people live in my computer! OH MY GOODNESS this is a dynamite photo, breath taking really and definitely a poster that the entire world would love!!!!!!!! That is so true. Sometimes you get a devoted follower and then they disappear. It's like losing a friend. Great photo the red is so vivid. I agree about wondering about bloggers when all the sudden they are no more. That's a big barn! Your boys look so small beside it, even on the tractor. I hate to see blogs go, too, and I wonder about the writers and how they're doing. I know what you mean about blogs going bye bye. I wish they would say good bye. The big red barn is fun. I would have taken lots of photos to! How cute! My granddad had a tractor nearly identical to this one. What a great photo! That red barn is so pretty. 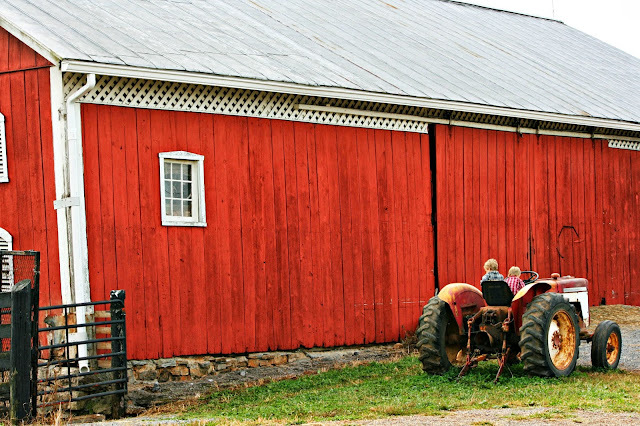 It is a charming barn Lisa -- love the bright red paint treatment. I hate it when people close their blogs.. sometimes there isn't enough time for posting, but still.. sad indeed..
Nice charm to enjoy. We always looked for a lot of fun playing tag in the barns. I remember sitting on the lawn tractors in Sears when in my early teens and still enjoying the childhood thrill. Never too early to start training them as farmers! Wonderful picture. And blogs that disappear, especially without notice. I, too, often wonder what has become of them. Blessings and Bear hugs, Lisa! You had me at red. Hard to believe that link is gone. It was very popular. I love the brilliant color of this picture and the barn! It IS sad when a blog disappears, and especially when someone just leaves without a word and we never know what happened! What an amazing picture! I love all the red you could in it. Usually when my blog friends go off the air, they're dead. One of the charming things about being among the older set. It's true, but we all move on. The only thing we can depend upon is change. I think a lot of bloggers have gone to Facebook. Great barn!!!! I remember Barn Charm! Wow! Love this picture, the barn is in sharp color and it is funny to have two children on the tractor. I like following blogs too. Sometimes, I miss those who do not update blog again, lol! I love this picture! Little boys and tractors and barns just go together :) And yes, it is sad when a favorite blog disappears. I really think that barn is beautiful! I'll bet the boys had a lot of fun pretending to drive the tractor!